This is how CC Witt, lead singer for Lyn Avenue and graphic design major at Armstrong, says she balances her music career and school work. Lyn Avenue is a local, self-proclaimed contemporary country band comprised of mostly Armstrong students. Patrick Ellington is the lead guitarist and a biology major and Randy Cuba is the drummer and a communications major. They, with Witt, have been performing together for roughly three years now. Recently, bassist Larry Jones joined the crew. Their first full-length album “The Other Side” is being released on April 5 at an all-ages show at Dub’s Pub on River Street from 7-10 p.m.
“We want our audiences to consider the other side – to look at a situation from both sides and be able to put themselves in someone else’s shoes,” Ellington said. Ellington and Witt write the band’s originals together and have natural musical chemistry, as they have been dating for five years. They say that Miranda Lambert, The Band Perry, Lady Antebellum and Kacey Musgraves are some of the artists that inspire them. Though Lyn Avenue began as an alternative band, incorporating elements of pop, rock and punk into their songs, their style of music and writing has evolved over the years. When the band isn’t playing a gig, Cuba and Witt both perform solo acts at local venues in and around Savannah, often accompanied by Ellington. “Between all of the band’s dates and all of our solo dates, one of us is always bound to be playing,” Witt said. Cuba notes that playing with the band and playing a solo gig are two very different yet equally gratifying experiences. The band invites all to attend their show this Saturday night to celebrate the release of their CD and perform its songs live. 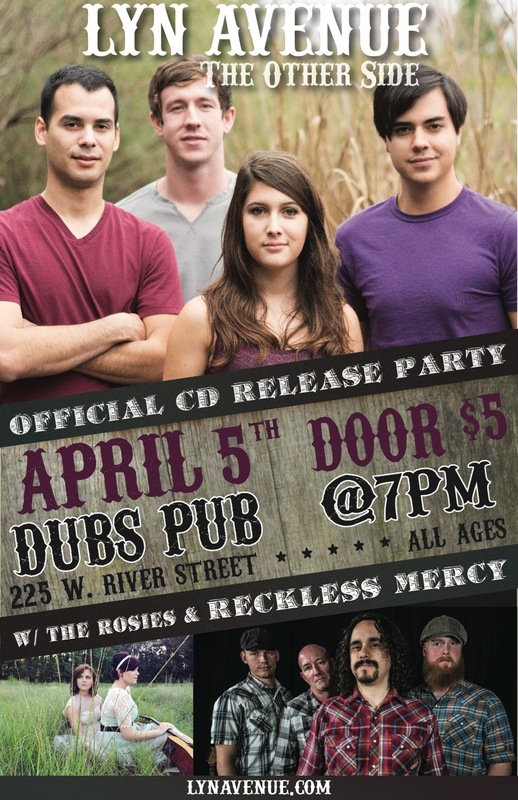 The Rosies and Reckless Mercy, two other local bands, will open the show. The Ethree Media Camera Crew, most commonly known for Jamie Casino’s Super Bowl commercial, will be filming the event. If you want to know more about Lyn Avenue or to hear some of their music, check them out at lynavenue.com or on Facebook.